For its inaugural residency week in the Silicon Valley, the Executive Masters in Technology Management (EMTM) program had no shortage activities, lessons and adventures to keep the class of 2019 busy. From February 17 to 21, EMTM learners were immersed in one of the world’s most innovative and forward-looking tech environments – Silicon Valley, California. From their home base in Berkeley, California, the cohort explored the three pillars of the EMTM program in ways that regular classroom learning can’t provide. 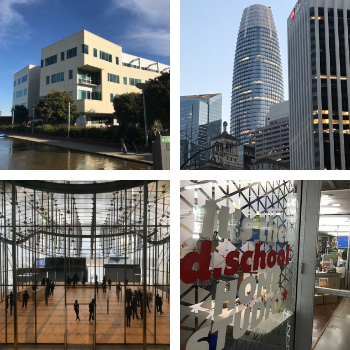 Innovation management, data literacy and design thinking were on full display throughout the week they spent at UC Berkeley, Stanford University’s d.school, Google, Ford’s Greenfield Labs and Autodesk. The first day of the residency introduced the EMTM cohort to Prof. Sara Beckman, one of the world’s leading authorities on design thinking based at the University of California at Berkeley. She routinely advises some of the world’s largest tech firms and most promising start-ups on using design thinking to drive innovation. “With design thinking, the goal is to de-mystify the different frameworks to understand how social and business processes interact,” says Beckman who added that the point of design thinking is not meant to simply solve the problem, but to define it. The second day of the residency sent the EMTM cohort to Palo Alto, first to take a class in capturing design insights with Michael Barry of the Stanford d. school before seeing how those kinds of insights are utilized at Ford’s Greenfield Labs and at Google. The lesson with Prof. Barry had the learners dive deep into the question, are insights more valuable than solutions? To find an answer, teams workshopped ways to capture insights from data as a way to establish need-finding – the process of protecting against unintended consequences in decision making. After class, the cohort enjoyed a tour of the Stanford d. school. A building dedicated to cultivating the innovative ideas, products and processes of Stanford graduate students from every faculty. Once their time at Stanford ended, the cohort was off to visit the Greenfield Laboratories of Ford Motor Company. Seeing the tremendous success that start-ups have had over the last three decades, larger companies like Ford began establishing their own start-up labs to generate and test new concepts and products. After the tour at Ford, it was off to visit one of the most established centres of innovation and data management in the world – Google. Upon arriving at the sprawling Google campus in Palo Alto, the cohort was greeted by Manuel Bronstein, VP Product for Google Assistant who shared his history of leading tech-focused teams at Microsoft, YouTube and Google. The third day of the residency was perhaps the most challenging, culminating the ideas captured from previous days and applying them to the particular business problems of the EMTM learners. Prof. Beckman challenged the class to find the difference between use and usability by describing the functional needs of their customer’s user journey. Once the class was able to build their canvasses, they travelled to Autodesk, an innovation incubator where interactive design, data management and strategy converge to solve the real-world challenges faced by the construction, manufacturing and entertainment industries. The leaders of Autodesk are sure that these industries will only move humans and machines closer together and design thinking will be a big part of ensuring those mergers are positive. After the fascinating tour of the kinds of projects Autodesk is working on, the cohort sat down with Jon Pitman, VP Corporate Strategy of Autodesk who spoke about the need to reduce material use across all industries. The final day of the residency focused on the importance of storytelling in distilling your corporate message to it purest form. No longer just the purview of marketers and communicators, storytelling is a key part in designing solutions because that is how you know if you’re connecting with consumers and users. The Silicon Valley residency will not soon be forgotten by the 2019 cohort. While its content and site visits will continue to be refined, its objective of showing learners the power they can harness through innovation management, data literacy and design thinking will always be the core lesson. To learn how you can join the next Silicon Valley residency as a member of the EMTM program, contact Jenny Adamthwaite.